BRIGHTON, Mich- When it comes to making real advancements in Ford technology, the Ford SYNC AppLink truly delivers the best for Ford drivers everywhere. The Ford SYNC AppLink was in many ways inspired by the USA Today APP, and with that inspiration comes a whole new driving experience for Ford Fusion drivers everywhere. 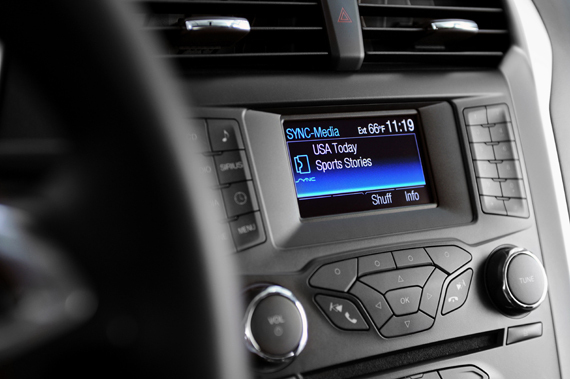 Ford Fusion drivers everywhere can now catch up on the latest in news, sports, and weather, all by utilizing simple voice commands that connect them with the Ford SYNC AppLink. This is truly beneficial as they can now listen to both new and old stories provided by the USA Today APP ranging from Money to Sports and much more. The original concept for the USA Today APP was designed to be used for smartphones and tablets. Yet, by taking it one step further, the USA Today APP adds a whole new level of staying easily informed with the Ford SYNC AppLink provided in all Ford Fusions. Furthermore, be sure to check the Ford Fusion rebates for more information about the AppLink. Thus, with everything from headlines to top categories, AppLink allows drivers to keep up with the latest information, mobile data, and more, all while being able to focus on driving with safety, security, and peace of mind. Truly this concept of the latest technology and keeping drivers more informed and up to date is a real advancement in App technology. Also, with safety first at mind, drivers can rest assured that they can hear the latest news and information, all while not having to take their hands off the wheel. Be sure to try it out for yourself today, check out the latest in Ford Fusion rebates, and get the best in everything that Ford has to offer with this new APP and its many advantages.